I had the pleasure of seeing the band Rush for the first time Friday night in Manchester, NH. It was the first show of the 2012 Clockwork Angels Tour, and it was a tremendous experience. 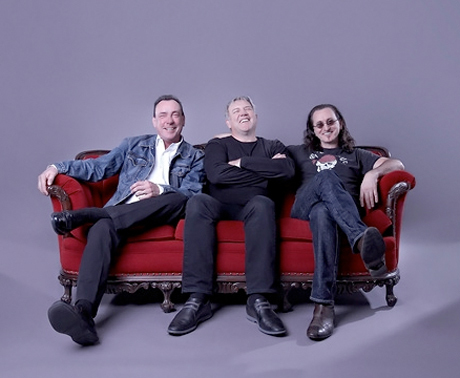 For those unfamiliar or haven't followed Rush, the current lineup of bassist Geddy Lee, guitarist Alex Lifeson and drummer Neil Peart, started in 1974. (earlier incarnations of the band began in 1968). These guys are all 59, Peart turns 60 on Wednesday and they are not showing any signs of slowing down. Lee has lost a bit of range from his trademark high voice and compensates here and there on some songs, but I'll tell you, these guys put on a show that brings it as good as it gets. These guys are not ready for the rocking chair! What is great about this trio is they are all amazing musicians and all three are definitely up there with the greatest with respect to their instruments. Some bands can boast having a great drummer, vocalist, bass player or guitarist, but it is rare to have all band members having such a high degree of talent on the same team and last as long. Rush is also third all time for consecutive gold or platinum records behind The Beatles and The Rolling Stones respectively. That's pretty impressive. And pretty surprising considering most people don't consider Rush up that high on the list of all time greats. Well, let me tell you. they belong there. I know that many people aren't crazy about Rush for a variety of reasons. There's the "you either love 'm or hate 'em" theme that's been around since they started. I've was never in either camp. I always respected them for their talents and liked a lot of their songs, but never really "got into" them. I don't know what got into me lately, but for some reason I just started "getting into" them and lo and behold, they just happened to be playing September 7 in my area. So I bought two tickets and dragged my wife along. Now in all fairness, my wife really has no idea of most of Rush's catalog although she did know a couple of songs. In all, it was a long night for her because of that and she's not really into that kind of music. That said, she did have a good time and enjoyed the show except that it was 3 hours long (which I warned her about) and they also shot off some fireworks that scared the crap out of her. They are one of the greatest live acts you will ever see. What you hear recorded is what you see live. The show is always entertaining with a central theme with a ton of interesting background video which always features the guys as some crazy characters. Three guys who really, really love what they're doing, are excellent at what they do, and really enjoy playing with each other and love their fans. Alex Lifeson. Wow. I always said, "well he's a great guitarist, but I'm not crazy about the solos he does." I have a new respect for him now that I've seen him live. Not only is he a truly great guitarist, his solos are amazing and really do fit with the music. I was so wrong about him all these years. In fact, I really thing that's the main reason I never really "got into" Rush. Their new material from Clockwork Angels is terrific. Most bands or artists that have been around as long Rush never really reach the heights they achieved earlier on that made them big. Jimmy Buffet comes to mind here... Rush are still writing great songs and have not lost one bit of the passion that drives them. Through all the years and all the changes, they never changed the core of who and what they are. In all, I highly recommend anyone who is enjoys seeing musicians who are simply masters at their craft to GO SEE RUSH.